Lead ions poison proteins throughout the body, blocking their normal function. The enzyme 5-aminolaevulinic acid dehydratase (ALAD) is composed of eight subunits, each poisoned by two lead ions (gray spheres) in this structure. Lead ions are not used by our cells, but they pose a constant danger to them. Lead is common in the environment, and since it is so easy to extract and shape, it has been used throughout human history to build pipes, to create shiny glazes on pots and brilliant white pigments for paints, and for many other useful things. Unfortunately, when these lead ions get into our bodies, they can bind to proteins, displacing the proper metal ions and corrupting their function. The result can be deadly as proteins in the brain and other organs are poisoned. One of the proteins poisoned by lead is involved in the synthesis of heme: 5-aminolaevulinic acid dehydratase (ALAD), also known as porphobilinogen synthase. ALAD performs the first step in production of heme rings, using a zinc ion to help catalyze the reaction. As shown in PDB entry 1qnv, lead ions displace these zinc ions, making the enzyme inactive. This process blocks formation of new heme groups and leads to one of the common symptoms of lead poisoning: anemia. Lead poisoning has lasting effects because it slowly builds up in the body. It is cleared within a month or so from proteins in the blood, but it lasts for years in the brain and decades locked up in bones. Lead poisoning is particularly dangerous to growing children because proteins involved in development of the central nervous system are very sensitive to lead. As a result, our society has worked hard to reduce accidental exposure to lead, for example, by banning lead paints and leaded gasolines. But problems still crop up, such as the combination of acidic river water and lead pipes that caused widespread lead poisoning in Flint, Michigan. Structures of two signaling proteins are shown with their normal calcium ions (green spheres) and poisoned by lead ions (gray spheres). Many signaling proteins use changing levels of calcium to regulate cellular activities. Lead poisons these proteins by interacting with their calcium-binding sites and reducing their sensitivity to calcium levels. Two examples are shown here. 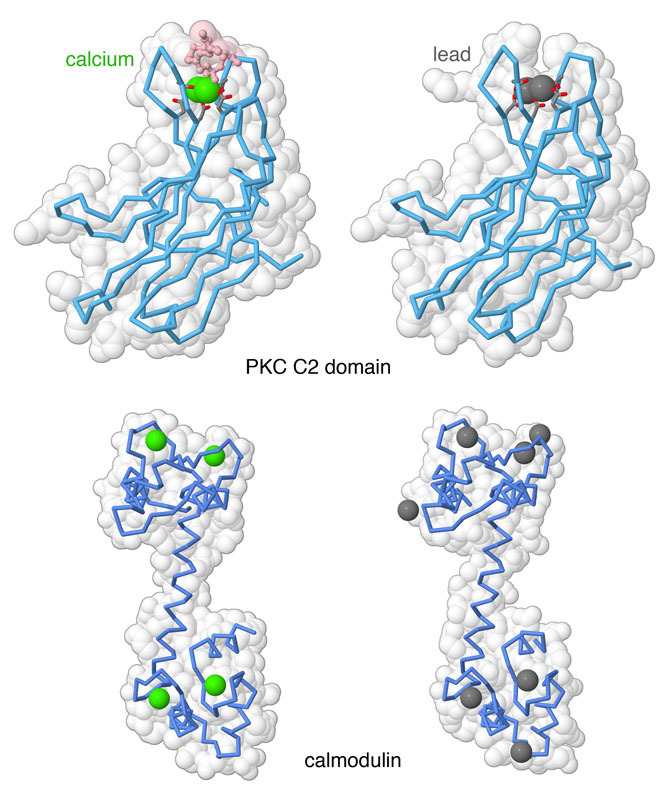 Protein kinase C has a small domain that uses two calcium ions to tether it to cell membranes as part of its signaling process. 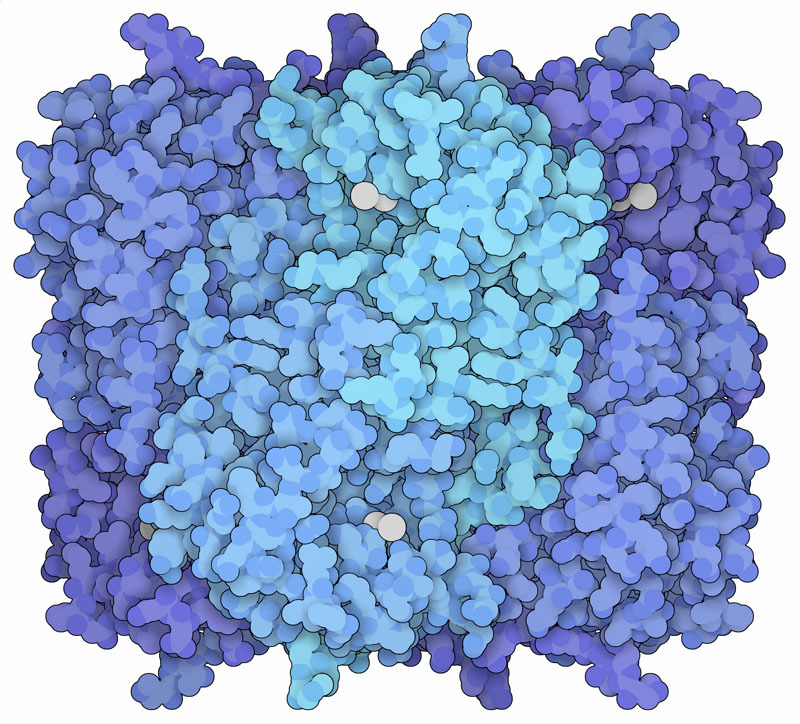 Calmodulin captures four calcium ions as it delivers its signal. By comparing the structures of the proteins bound to calcium and to lead, we see that the lead occupies the calcium-binding sites in both proteins, as well as a few additional sites (PDB entries 1dsy, 3twy, 1exr, 2v01). Enzymes use specific arrangements of amino acids to capture zinc and calcium ions. In ALAD, three cysteine amino acids are arranged in a triangle to coordinate zinc ions, and proteins like calmodulin often use acidic amino acids to capture calcium. Lead is more agnostic than these two ions and can bind to both types of sites. Click on the image to take a closer look at zinc, lead and mercury binding sites in ALAD (PDB entries 1ylv, 1qnv, 1qml). Several dozen structures of lead bound to proteins are available at the PDB—try looking at the Ligand Summary page for lead to find them. 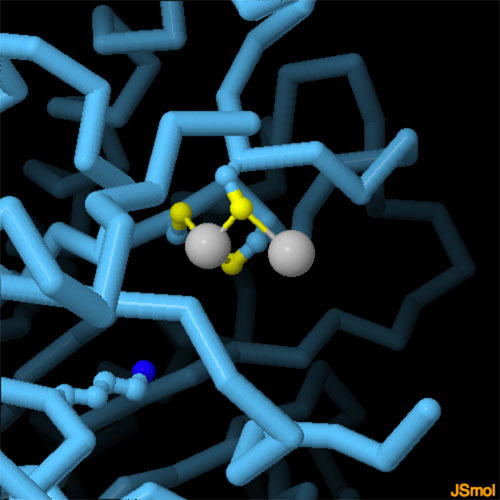 You can also find structures for metalloproteins that might be sensitive to lead poisoning by using the Ligand Summary page for calcium and the Ligand Summary page for zinc. 3twy: K. A. Morales, M. Lasagna, A. V. Gribenko, Y. Yoon, G. D. Reinhart, J. C. Lee, W. Cho, P. Li & T. I. Igumenova (2011) Pb2+ as modulator of protein-membrane interactions. Journal of the American Chemical Society 133, 10599-10611. 2v01: P. Kursula & V. Majava (2007) A structural insight into lead neurotoxicity and calmodulin activation by heavy metals. Acta Crystallographica F63, 653-656. Garza, R. Vega, E. Soto (2006) Cellular mechanisms of lead neurotoxicity. Medical Science Monitor 12, RA57-65. 1exr: M. A. Wilson & A. T. Brunger (2000) The 1.0 A crystal structure of Ca(2+)-bound calmodulin: an analysis of disorder and implications for functionally relevant plasticity. Journal of Molecular Biology 301, 1237-1256. 1qnv: P. T. Erskine, E. M. H. Duke, I. J. Tickle, N. M. Senior, M. J. Warren & J. B. Cooper (2000) MAD analyses of yeast 5-aminolaevulinic acid dehydratase: their use in structure determination and in defining the metal binding sites. Acta Crystallographica D56, 421-430. 1ylv: P. T. Erskine, R. Newbold, J. Roper, A. Coker, M. J. Warren, P. M. Shoolingin-Jordan, S. P. Wood & J. B. Cooper (1999) The Schiff base complex of yeast 5-aminolaevulinic acid dehydratase with laevulinic acid. Protein Science 8, 1250-1256. 1dsy: N. Verdaguer, S. Corbalan-Garcia, W. F. Ochoa, I. Fita & J. C. Gomez-Fernandez (1999) Ca(2+) bridges the C2 membrane-binding domain of protein kinase Calpha directly to phosphatidylserine. EMBO Journal 18, 6329-6338. M. J. Warren, J. B. Cooper, S. P. Wood & P. M. Shoolingin-Jordan (1998) Lead poisoning, haem synthesis and 5-aminolaevulinic acid dehydratase. Trends in Biochemical Sciences 23, 217-221.